Cambridge Audio must have seen the £500 price point as a hole that needed filling. 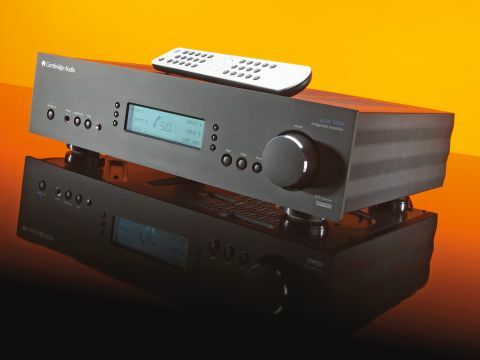 Hence the Azur 740 series, which comprises a CD player and this 740A integrated amplifier. The amp is superficially closer to the more expensive 840A, but lacks the unique 'Class XD' technology, which makes it more similar electronically to the 640A v2, its existing and less costly brother. In concept, there is nothing too surprising going on here. 100 watts is, these days, not outrageously powerful for such an amp and six line inputs (no phono option) are par for the course today. The two record outputs, preamp output and headphone socket are hardly uncommon and neither are the twin (switchable) speaker terminals. These allow for either bi-wiring or two-room operation. Remote control connections are more sophisticated, though, thanks to the inclusion of Cambridge's own 'Incognito' multiroom system. There's also more control sophistication than most amps, thanks to the adoption of the 840A's display. This gives a numerical readout of volume setting and allows inputs to be named to suit circumstances. You can adjust balance, too, as the volume control is electronic, and indeed bass and treble should you feel the need. Unlike the 840A, this is all achieved without the rattle of relays. A heavy and well-filled box, the 740A has a large toroidal mains transformer, half surrounded by a profiled heatsink for two pairs of output transistors per channel. Separate rectifiers and fairly generous capacitor banks feed each channel, and there's extensive buffering of signals. As with other Azur models, clipping protection simply turns down the volume. This is a lot of amplifier for the money. It's also a lot of sound. Common sense and history both suggest that features and sound can be a trade-off at this price. But with plenty of recent experience in £500 amplifiers in mind, we found no reason to question the balance achieved here. That experience suggests that we should be looking, as a minimum, for competence in all areas, excellence in at least some and, crucially, some of the little extras that point the way towards the high end. We couldn't accuse any area of failing in competence. Perhaps the bass is less assured than some (the 840A, for a start), especially in terms of definition at low levels. Still, it is certainly extended and the generous reserves of power do no harm at all in assuring its kick and dynamism. Excellence? We could happily use the term in connection with the treble, which is as clear as a bell and breathes with uncommon ease. The imaging is not far short either, with superb width and lateral resolution, and fine depth too. And the little extras... probably what most appeals, overall, about this amp's performance is its sense of inviting the listener into the music, something more than just listening comfort or technical competence. We've heard this in other amps at the price (the Creek Evo springs to mind) but it's not something one can take for granted, and it does indeed give a flavour of what esoteric kit is all about. We could use more detail than the 740A offers (it's bigger brother sets a high standard of detail that justifies the extra expense). We have heard better bass at its price, too. But, all things considered, the 740A is a very worthy amp, one we're happy to recommend.